Shop for Comsewogue Football & Cheer Gear at our League Stores, powered by Squadlocker®!! 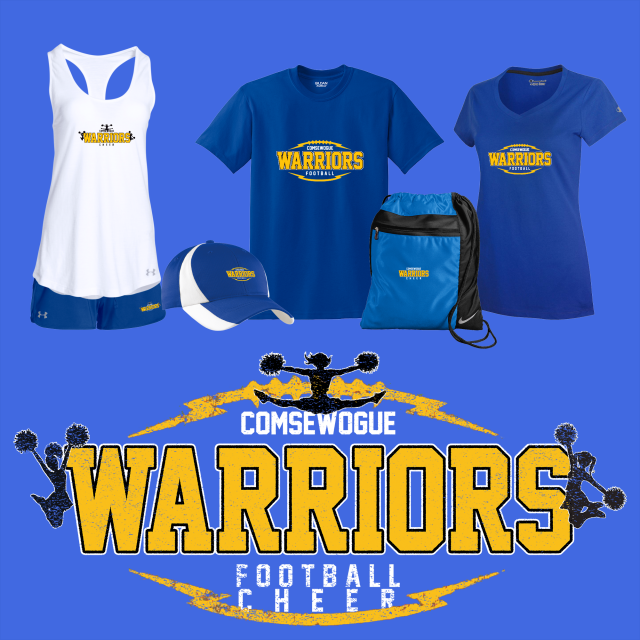 Get your Comsewogue Warriors Gear order delivered straight to your door!! FREE RETURNS too if any item does not meet your expectations!! Orders are shipped once a month and will ship direct from Squadlocker® to your address!! Tees, Polos, Hoodies, Shorts, Pants, Outerwear, Headwear and Bags manufactured by brand names such as Under Armour and Badger! Personalization: Many items can be personalized with a name and a number! Dedicated customer service team: contact Squadlocker® by chat or phone: You can always reach Squadlocker® via chat by clicking on the chat bubble while shopping. Squadlocker® even has real people you can speak with by calling 888-885-6253 Monday thru Friday from 8:30 am until 5:30 pm EST. Squadlocker® decorates, personalizes and kits every order and ships it directly to the player’s “ship to” address. Best-in-class return policy: Squadlocker® wants you to be happy with the items you buy and the way you are treated while shopping from Squadlocker®. That’s why Squadlocker® developed their Customer Bill Of Rights to demonstrate their commitment to you. Squadlocker® is proud of their no hassle return policy. Every order is shipped with a prepaid return label, simply ship back the items you are dissatisfied with in the original packaging and include a note explaining if you would like credit or to exchange it for a different size or item.